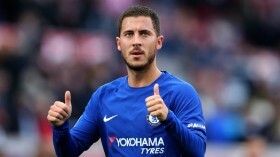 Belgian football expert Kristof Terreur has revealed that Eden Hazard is 'waiting' for the opportunity to join Real Madrid after turning down a contract extension with Chelsea. The 28-year-old has been hugely influential towards the Blues' success over the past six-and-a-half seasons but his future with the club remains doubtful with his contract expiring in 18 months' time. Speaking on Sky Sports' Transfer Window Podcast, Terreur has revealed that Hazard has turned down a couple of contract offers from the Blues in the hope that Los Blancos will make an approach for him in the summer. The European champions are said to have enquired regarding the Belgian's availability shortly after the World Cup, only to be informed that he is not for sale. However, the Blues' stance could chance by the end of the season, should they find no breakthrough in terms of prolonging the Belgian's contract. Hazard has been simply sublime for the Blues in the Premier League this term and he has contributed 10 goals and 10 assists from just 21 appearances.